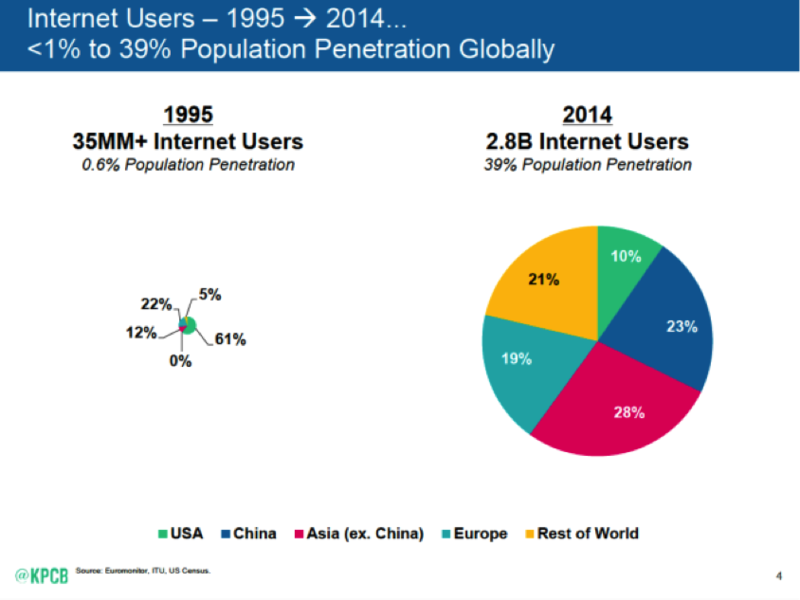 / 5 major takeaways from Mary Meeker’s Internet Trends Report. The verdict’s in. Big-time Internet stock analyst Mary Meeker gave her highly sought-after annual Internet Trends Report at the 2015 Code Conference in California last week. Meeker, who’s been releasing such research since 1995, is a foremost expert on Internet trends and currently works as a partner at venture capital firm, Kleiner Perkins Caufield Byers. 1. Internet usage will continue to rise. 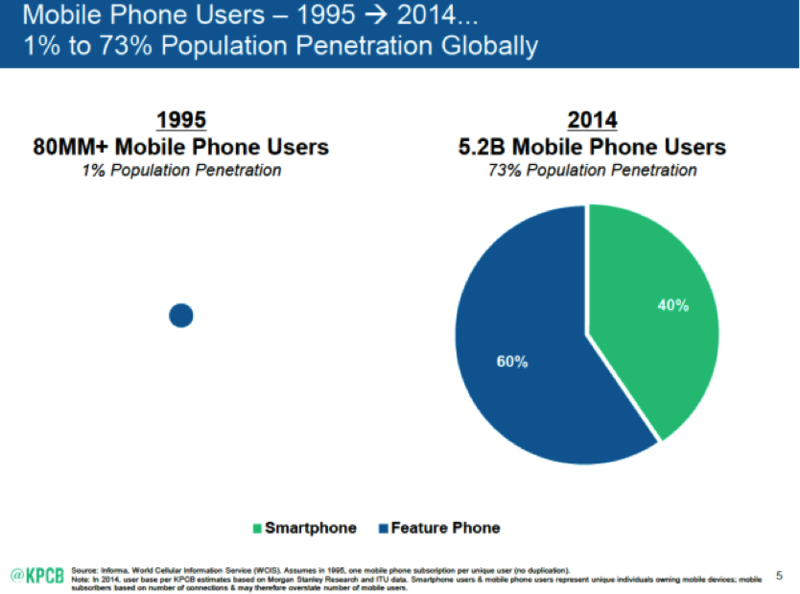 According to Meeker, both Internet and smartphone user growth is stable, but the growth is slowing down. Up from 0.6% of the population, almost 20 years later, it stands at 39% population penetration. 2. Visual content is taking over. Video viewing accounts for 64% of consumer Internet traffic and 55% of mobile traffic. Facebook gets four billion video views per day, which is up four times in six months, while Twitch has 100 million monthly active users, up 122% this year alone. 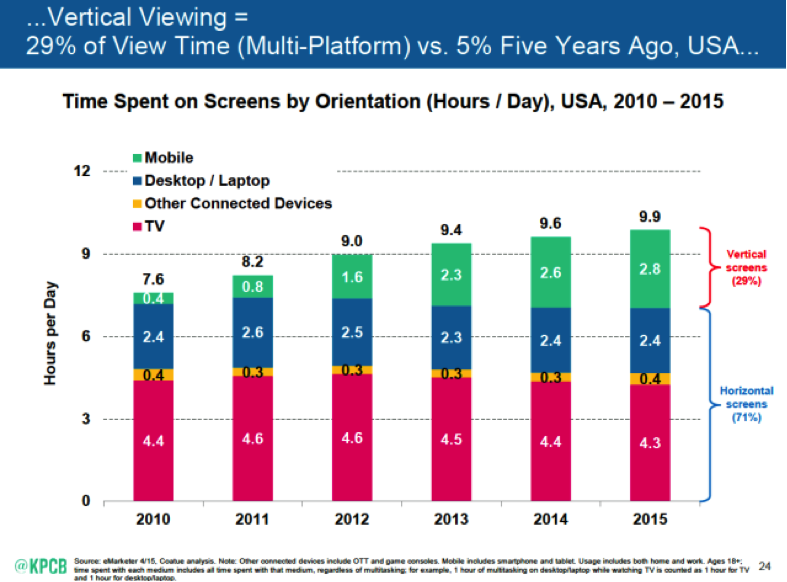 Additionally, vertical viewing on mobile devices is currently 29% of time spent looking at screens, which is up 5% from five years ago. Mobile phones are requiring video formats to change from horizontal to vertical displays. 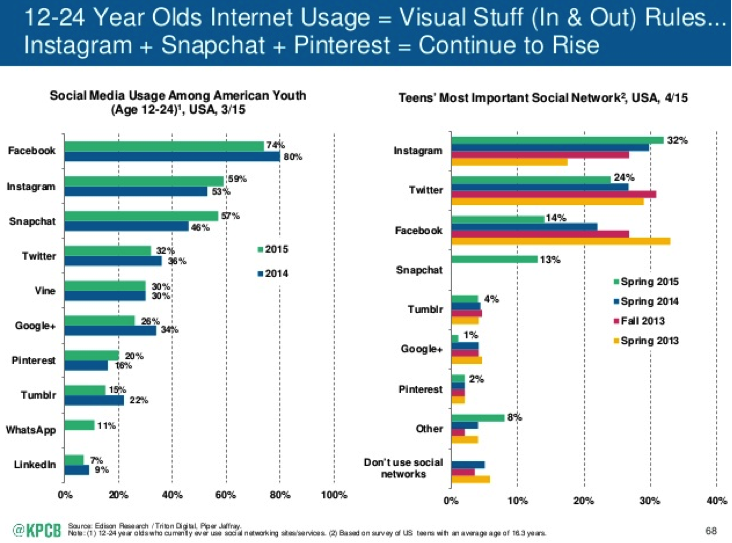 Meeker revealed, unsurprisingly, that today’s Internet trendsetters are 12-24 year-olds. She also revealed that this age demographic is particularly hooked on “visual stuff.” Over the past two years, as Facebook use has significantly dropped among teens, it’s evident that millennials are shifting their interest and devotion to other platforms like Instagram and Snapchat. Consistent with these results, Meeker also showed that 44% of millennials use their phone’s camera daily. She suggested that this trend will affect millennials’ expectations in the workforce, as they are in the habit of expecting immediate results. 3. Messaging apps are hot (and getting hotter). New apps seem to be ever on the rise. 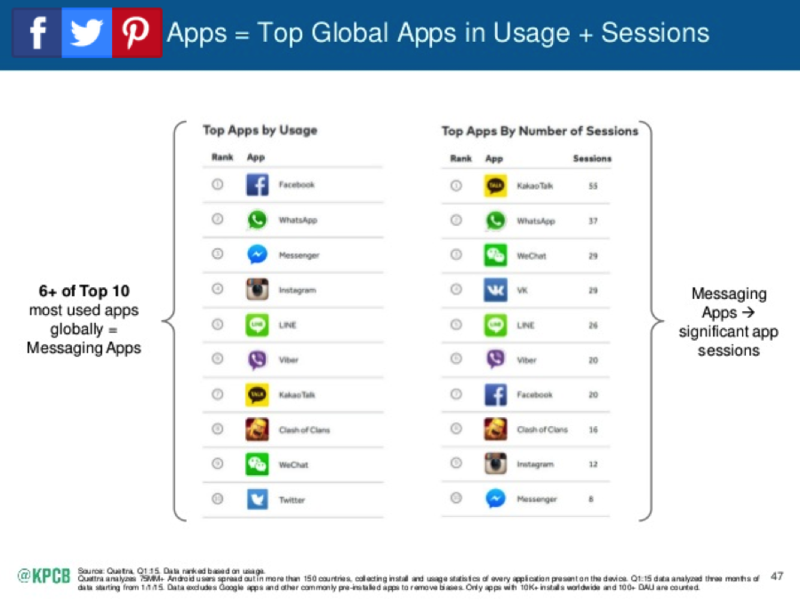 Meeker pointed out that six of the top 10 most-frequently used apps in the world are messaging apps. Messaging apps are not used solely for communications, but are evolving into multipurpose hubs, and are used for things like commerce and computing. Today, Asia’s most popular apps are providing a mesh of various apps like Uber, Snapchat, SMS, FaceTime, Seamless, and Amazon, all in one. “Watch this space,” Meeker said. 4. Drone technology is on the rise. Random? Apparently not. According to Meeker, drone growth is unique, fast, and global. Drone sales are up 170% from last year, and are used for infrastructure inspection, disaster relief, and everything in between. Shipments are estimated to reach 4.3 million units in 2015, with revenues projected to reach $1.7 billion. Currently, more than 400 U.S. companies are approved to operate drones commercially. 5. Mobile is taking over the world. When it comes to mobile tech, the U.S. isn’t the only country leading the charge. In fact, the U.S. is outpaced by six other countries in terms of mobilization. 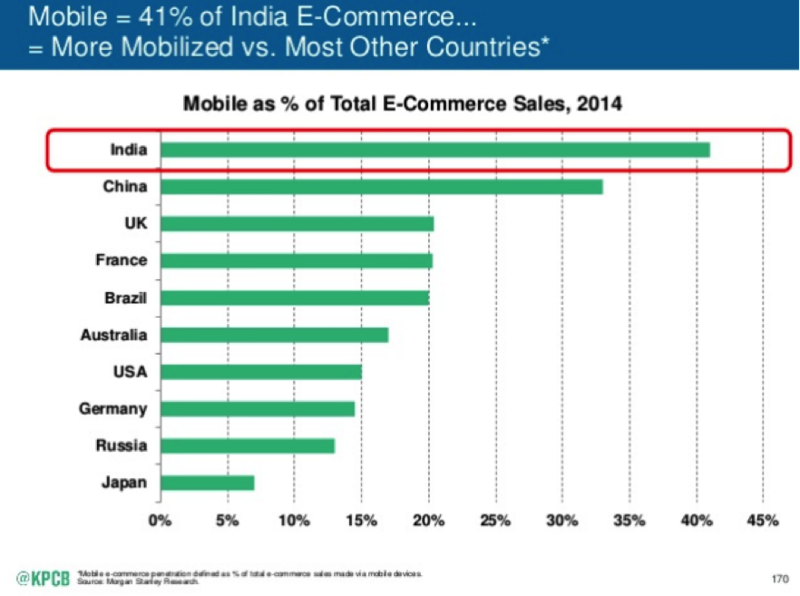 India is the most mobilized country in the whole world. India now leads the world in smartphone and Internet growth, as it has 232 million Internet users, up by 37% (63 million) from last year. China is a close second, followed by the UK, France, and Brazil.